The point here is, if you ask 10 designers how they got started in design, you will most likely hear 10 different funny stories. Most often the stories go thus “Oh! I was just reading on typography and became fascinated with it so I started creating designs with it and boom.” Not to trivialize the different ways we learn but to show the lack of a structured learning process for design education in Africa. In Africa, there aren’t a lot of web design schools one can go to learn web design. Thank goodness for online learning platforms like Coursera, Udacity, Pluralsight and YouTube — which afforded designers in Africa with the opportunity to learn design so as to scale their careers and keep up with existing technology as designers. This is one of the main reasons why we at Figma Africa (a platform for the designers in Africa to come to interact, mentor, learn, grow and profit together while engaging in design activities) are so focused on Design Education across the African continent and we are excited about how much progress we have made so far especially from seeing how much recognition design education is getting nowadays. 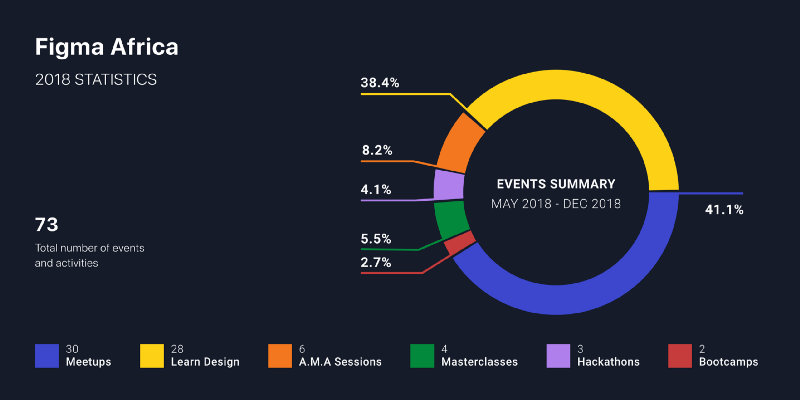 We officially launched the design community in May 2018 in Lagos and by the end of 2018 we were in 8 countries, 17 cities and we had 25 design ambassadors across these places advocating for the community and facilitating learn design sessions because we realized the impact gotten from Learn Design sessions were much greater than that of meetups. As we progressed, the community grew to the extent where members were freely interacting among themselves in private and this was one of the soft goals we set out to achieve. We used Slack as our official communication platform but we had WhatsApp groups for some of the communities that might have difficulty fitting in on Slack an example is the Congo DR community where French is the official language there. In order not to feel secluded from the outside ecosystem, we started hosting A.M.A (Ask Me Anything) sessions with Design Leaders from different design fields. We hosted world-class designers from Figma, Netflix, Microsoft and had one with the Engineering Manager of Paystack. These sessions offered our members the opportunity to interact with the AMA Guests, learn from their experience and also get answers to unasked questions that might have been bothering us. Too many materials, resources, and mentors — making it confusing. Lack of materials, resources, and mentors for proper guidance. Sometimes they just need some guidance to point them in the right direction on how to get started. Interacting with others going through the same beginners’ struggle has also proven useful in providing guidance. As mentioned earlier, there’s no clearly defined structure for learning web design unlike coding and this makes it difficult to for those interested in learning it to get started so they usually just end up doing a crash course on everything tagged “Design” that they could find on the internet in an attempt to make progress. Figma Africa launched along with a free Design learning program (special thanks to Zach Grosser for creating the curriculum) that was self-paced and came with a well-curated curriculum, weekly activities, learning materials and resources for those interested in learning design to get started with. This didn’t go hitch-free but we found a way of adapting it to the individual communities and making it work especially with the many design reviews and weekly documentation of activities. We successfully hosted 73 events this means we were hosting a minimum of 2 events every week and usually in different cities. This would not be possible without the help of our ambassadors who organize and facilitate these events and activities. Special thanks to our ambassadors listed below. Our goal for 2019 still very much remains the same and that is to continue making design education accessible to designers across Africa. As usual, we partnered with a lot of Hubs and workspaces last year and we look forward to partnering with a lot more this year. The Figma Africa weekly design challenge has been helpful for designers looking to build their portfolios. Last year we ran more than 20 design challenges on a weekly basis. This year we intend to make it even more rewarding with paired design challenges to give the experience of working in a team or office. Partnerships are an important part of our success. From providing event venues to footing some of the bills for these activities especially for some of our events hosted in locations where we are just starting out. We are hoping to partner with a lot more Hubs, Workspaces, Companies and other communities.